coming forth by day: War! What is it good for? Time to go deeper into the mysteries of ancient Egypt. The most mysterious of all is Osiris and what his death, dismembering, remembering and eventual consignment to the underworld means? I have written extensively on Osiris over the course of the last year and now armed with this knowledge it is time to go even further into the hidden impact Osiris has had on civilization. It's best to take this a step at a time so let's start with Osiris and his relationship to Orion. 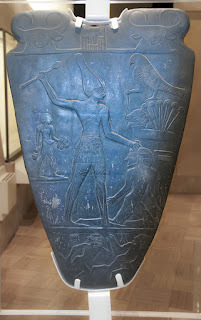 I have previously described Osiris' connection to the giant in the sky Orion and the sacred site of Giza. 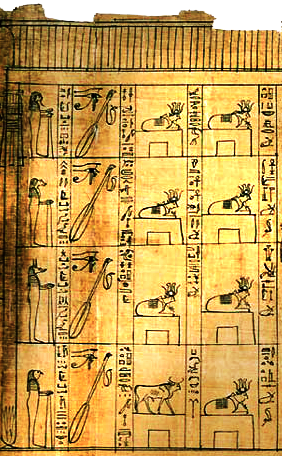 the Bull of the Sky has given you his hand....."
may the Bull of the Sky take your hand..."
The ancient Egyptians described the great incorruptible mummified spiritual body as the Sahu. The hero Heru (Horus to the Greeks) upon material death becomes an akh (after successfully passing the judgement), a great glowing spiritual body of transfigured wisdom and intelligence, which then joins the great all encompassing Sahu. Another way of describing the Sahu in modern terms is by drawing a parallel to the Christian religion. You experience material birth with a latent soul within you. At some point you are hopefully born again (the soul reawakens from the sleep of death) like the preachers on late night TV stress, you then fight the Devil, hopefully win, and are transfigured. Upon material death you are judged and if all goes well you go to heaven and join the body of Christ. If the decision goes against you, you go to Hell where the Devil is. But you just fought the Devil here on earth? Where does this guy live? Earth or Hell? Anyway you figure out where you go, I have wandered off topic. The Sahu was personified by the constellation of Orion in the night sky. Orion is of course the great Osiris (Asar to the ancient Egyptians). Orion disappears from the night sky in late spring for seventy days and the ancient Egyptians' process of mummification mimicked this disappearance in the length of the embalming practice. Osiris as the personification of the ba soul needed to be remembered and reconstituted after being assassinated by Set upon his appearance in this material place of existence. This remembering of who you really are allows you to engender a new life that is born again as Horus. This Horus still has to fight off this Set and win in order to become transfigured and rejoin his father Osiris the great Sahu in the constellation of Orion. Alright let's start investigating Orion. A good place to start is always the Online Etymology Dictionary. late 14th century, from Greek Oarion, of unknown origin, though some speculate on Akkadian Uru-anna "the Light of Heaven." 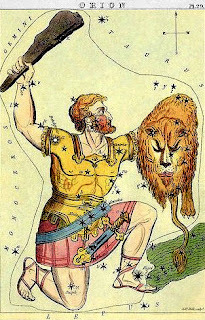 Another Greek name for the constellation was Kandaon, a title of Ares, god of war, and it is represented in most cultures as a giant (e.g. Old Irish Caomai "the Armed King," Old Norse Orwandil, Old Saxon Ebuðrung). Orion, when dominating the southern night sky, undeniably lights up the heavens. I've come across many examples of prefixes and suffixes such as ur, ar, and or relating to a great light while an can refer to a spirit or the heavens. The other title, Kandaon, which refers to a giant and is a title of Ares is quite interesting. 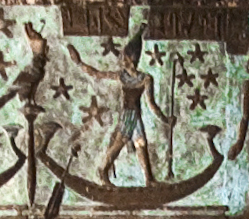 Ares was the god of war and is a peculiar moniker for a constellation that the ancient Egyptians considered to be the peaceful Osiris. At the same time, the ancient Hungarians considered their forefather to be Orion, who as Nimrod the great hunter and warrior, was a descendant of Ham - a son of Noah. At this point in our investigation I'm going to veer a little off course and on to a road called observation. Do yourself a favour and one night find out what time Orion is going to rise in the south-eastern night sky after sunset. He rises on his side with the three stars of his belt erect. As the stars of the constellation move in procession, Orion stands up in the night sky as this giant who strikes a smiting pose. If you investigate the mythology of ancient civilizations then this warrior pose is unmistakable. The iconography of the cycle of Orion is unmistakable. He is not only a dying and resurrected god-man but also a mighty warrior. late 14th century, from Old French cimetiere "graveyard" (12th century), from Late Latin coemeterium, from Greek koimeterion "sleeping place, dormitory," from koimao "to put to sleep," keimai "I lie down," from Proto-Indo-European base *kei- "to lie, rest" (confer Goth haims "village," Old English ham "home, house, dwelling"); see home. Early Christian writers were the first to use it for "burial ground," though the Greek word also were anciently used of the sleep of death. An Old English word for this was licburg. There are many cognate relationships between Caomai and words for where the dead go to rest in peace. I've stressed before the mythology of Osiris whereas the ba he is our immortal soul that is in the throes of the sleep of death. Sometimes it is difficult see through the fog of death and what I mean by that is that there is a material death and a spiritual death. We are all familiar with material death but not so familiar by what is meant by spiritual death. Tracing the history of the word cemetery we find interesting parallels with words for the constellation of Orion and his spiritual death in matter. < Medieval Latin, Latin bellātrīx martial, waging war, equivalent to bellā ( re ) to wage war, (verbal derivative of bellum war) + -trīx -trix; apparently by association with bellātor a name for Orion ( Latin: warrior), though precise connection with this star unexplained. Bellatrix. Dictionary.com. Dictionary.com Unabridged. Random House, Inc. http://dictionary.reference.com/browse/Bellatrix (accessed: February 19, 2012). bright star in the left shoulder of Orion, from Latin bellatrix "a female warrior," frequently used as an adjective, "warlike, skilled in war," feminine of bellator "to wage war," from bellum "war." The Latin name, from the Alfonsine Tables (mid-13th century), very loosely translates the Arabic name for the star, Al Najid "the conqueror." In keeping with the martial theme, the right leg of Orion (bottom left of the constellation from our point of view) is Saiph, from Saif al Jabbar, which means "sword of the giant." early 14th century., from Old French urine (12th century), from Latin urina "urine," from Proto-Indo-European *ur- (confer Greek ouron "urine"), variant of base *awer- "to moisten, flow" (confer Sanskrit var "water," Avestan var "rain," Lithuanian jures "sea," Old English wær, Old Norse ver "sea," Old Norse ur "drizzling rain." Urinate is a 1590s back-formation from urination (early 15th century). The letter 'u' can be pronounced as a 'w' in many archaic languages enabling the connection to the word for war bellum becoming more commonly referred to as war. late Old English (c. 1050), wyrre, werre, from Old North French werre "war" (French guerre), from Frankish *werra, from Proto Germanic *werso (confer Old Saxon werran, Old High German werran, German verwirren "to confuse, perplex"). Cognates suggest the original sense was "to bring into confusion." There was no common Germanic word for "war" at the dawn of historical times. Old English had many poetic words for "war" (guð, heaðo, hild, wig, all common in personal names), but the usual one to translate Latin bellum was gewin "struggle, strife" (related to win). Spanish, Portugeuse, Italian guerra are from the same source; Romanic peoples turned to Germanic for a word to avoid Latin bellum because its form tended to merge with bello- "beautiful." The verb meaning "to make war on" is recorded from mid-12th century. So this lays the groundwork for the blog entries to follow. There seems to be a couple of aspects to Osiris as Orion. There is the peaceful Osiris but also the warlike one. 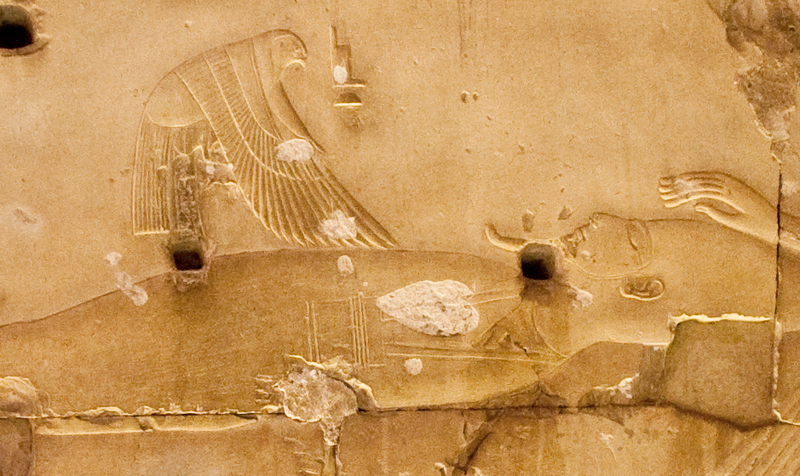 Can we find the warlike Orion in ancient Egypt?